JOBY energizes smartphones on the go with the JOBY PowerBand for Apple® or Android® smartphones. The JOBY PowerBand’s slim and compact design frees consumers from relying on affixed power sources and works with many smartphone sizes including the Apple iPhone 6, 6S, SE, 6 Plus, and 6S Plus, as well as Android models such as LG G4, Samsung Galaxy Note 5, Samsung Galaxy S6, S7 and Edge+ models, among many others. This versatile power pack provides additional hands-free power needed for smartphones while also providing a solution that will grow with your device as form factors change. The JOBY PowerBand is compatible with Apple (US MSRP $59.95) and Android (US MSRP $49.95) smartphone models, attaching to these devices with web-like silicone bands that stretch over the phone for a snug fit, with or without a protective case. Built-in Lightning™ connector for Apple devices and micro USB for Android devices ensure users will have charging cords at the ready. Constructed of durable ABS plastic, the Lithium-Polymer 3500 mAH battery provides enough power to charge your device one to two times depending upon the device’s battery capacity, phone usage, and phone battery lifecycle. It weighs just 3.1 ounces. Tether-free Power: Get the only power solution that attaches to your smartphone, but is not an oversized and bulky battery case. Built-in Charging: Never worry about long, loose or lost cords. The charge cable is a built-in MFi Certified Lightning™ connector for Apple® devices. Universal Fit: Works with all Apple® smartphones with a Lightning™ connector. Low profile, silicone bands stretch over the phone for a snug fit, with or without a case. With some larger protective cases, removing the phone may be necessary to charge. 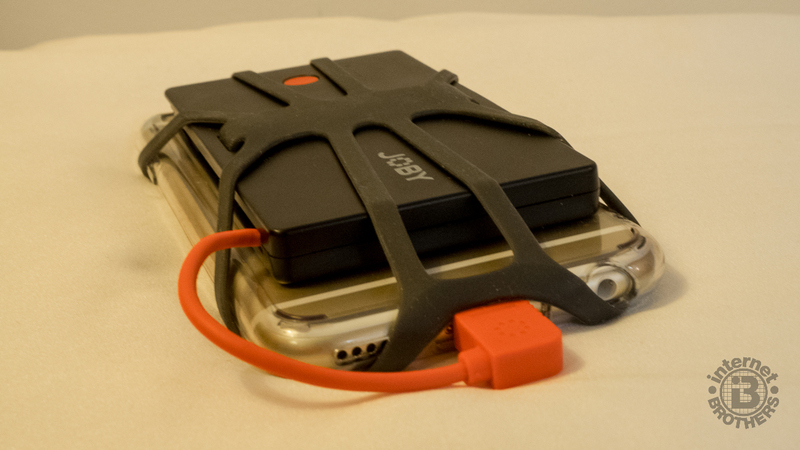 Lightweight Battery: The 3500 mAh LiPo battery provides enough power to charge your device once or twice, depending on your device, to keep you connected. Slim & Pocketable: PowerBand has a narrow profile that adds minimal bulk to your phone while boosting your power. This is the PowerBand attached to my iPhone 6S. Makes a nice compact package. When hiking, I like to use the built-in GPS facility in my iPhone along with the Gaia GPS tracking software to draw a map of the trails I traverse. I then publish the map with my trail reports so that you can download the GPX file to your own smartphone, and use it as your guide. On rare occasions, during a particularly long hike, my iPhone battery has completely discharged before finishing; surely a disappointing occurrence. It used to happen more frequently on my older iPhone with the more tired battery. A smartphone is also a helpful safety device for modern hikers, enabling the contact of emergency services when trouble or injury arises. Maintaining a charge in the phone’s battery may mean the difference between being rescued or lost. So having the ability to recharge your phone on the go is important for safety and security. Some of these portable battery packs will recharge your phone 4-5 times, but they’re like carrying a brick. Heavy and cumbersome, they aren’t ideal for hikers. There are others that are smaller and lighter, but their charge capacity is correspondingly limited. The JOBY PowerBand will only charge your phone once or twice, but it is extremely compact and lightweight. Being able to attach it directly to the iPhone with the silicon bands, yet still perform every function on the phone is thoughtful engineering… and it still fits snugly in your pocket. The PowerBand itself is easy to recharge with the included 9″ USB to Micro USB cable. On the pros side of the ledger: the JOBY PowerBand is quite lightweight… checking in at 3.1 ounces. While it seemed at first to make my 4.6 ounce iPhone 6S somewhat bulky, when comparing this slim form factor (0.43 in.) to others on the market I was definitely pleased. I also really like the ability to attach it directly to the phone so it is all one piece rather than having to find room for two separate devices in my pocket or backpack. My experience with recharge capacity was also positive… even a little better than I expected. The JOBY PowerBand is advertised to recharge the iPhone 6S one time. I was able to get 1.5 to 1.75 charges with the PowerBand. That can really come in handy on an overnight hiking excursion. What I can’t decide is whether to save the battery pack for recharging once the phone battery is near depletion, or to leave the battery pack turned on all the time keeping my phone battery at a constant 100% charge. Further practice will determine the best answer for this. You don’t have to make sure you packed a recharging cable before you leave the house. I have done that: be out on a hike, pull out the recharging battery pack, then go WAIT, WHERE’S THE CABLE? The Lightning™ cable is built-in. It always stays with the battery pack. So too the silicone bands that attach the PowerBand to your iPhone. They are always there. So, what are the cons? I worry about those silicone bands. How long will they last before stretching them one time too many and… SNAP! Especially if I had an iPhone 6S Plus, I would be nervous. The bands fit very snug on my 6S. They would really have to stretch to fit over the corners of a 6S Plus. When comparing the $59.95 price with battery packs that have comparable storage capacity, the JOBY PowerBand is quite pricey. I even had a JOBY coupon I had saved that enabled me to purchase the PowerBand for $45. That, to me, is still too much. In this case you are paying for the convenience. It’s up to you to decide if that convenience is worth the price. You can purchase the PowerBand Lightning for iPhone directly from JOBY for US$59.95. Shipping is free. Android PowerBands are US$49.95. All JOBY products come with a limited consumer warranty covering any defects in material or workmanship for one (1) year. Located in the San Francisco Bay area, JOBY has been building functional and adaptable products for action cam, smartphone, tablet, DSLR, and point and shoot camera users for more than a decade. JOBY redefined the tripod industry when it developed the innovative GorillaPod™ flexible tripod. I have owned a GorillaPod™ myself for five years and it has become a regular utensil when I go hiking.